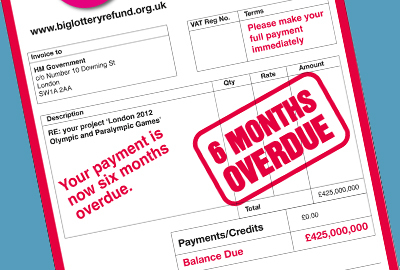 Charity sector campaigners have issued an overdue ‘invoice’ to the government for failing to repay money spent on the Olympics to the National Lottery six months after the end of the games. The previous government used £675m from lottery sources to help pay for the infrastructure needed for the London Olympics. But the Big Lottery Refund campaign, which is led by the Directory for Social Change, is calling for £425m of this money – the amount taken from the Big Lottery Fund – to be returned to the BLF for distribution to charities and community groups. The government has pledged to return the £675m by 2030/31, but the campaigners are asking for the immediate return of the £425m. Campaigners estimate that the money could support 10,000 charities, which serve eight million beneficiaries. More than 3,300 charities have signed up to support the refund campaign. The mock invoice to the government says that payment is six months overdue. Debra Allcock Tyler, chief executive of the DSC, said: "It is increasingly clear that hundreds of millions in the Olympic budget remains unspent. There is a clear moral case for the swift return of these funds to the lottery good causes that made sacrifices to make the games a success. "Depriving communities and vulnerable people of vital support during these difficult times amounts to moral theft and cannot continue. The government needs to pay back the money that was borrowed now." Hugh Robertson, the sports minister, said last month that up to £150m of the money taken for the Olympics might be returned to the lottery distributors next year, but campaigners maintain that this is not enough, and not soon enough. A spokesman for the Department for Culture, Media and Sport said: "We have been completely clear how money will be returned to good causes. The National Lottery distributors are entitled to £675m of receipts from the sale of the land on the Olympic Park and more than £69m from the Olympic village sale, while any funds remaining in the Olympic Lottery Distribution Fund will also go to them."